Rotorua tenor Frederick Jones took out the $20,000 Dame Malvina Major Foundation first prize at the New Zealand Aria competition in his hometown last night. The singer, who recently completed a Master of Arts in Advanced Vocal Studies with Distinction at the Wales International Academy of Voice, “rose to the top” of a field of outstanding contestants according to adjudicator, Australian operatic tenor Glenn Winslade. His fellow adjudicator, Sydney-based opera singer and director Luise Napier agreed that the calibre of the competitors was exceptionally high. “There must be something in the water for you to produce such an overabundance of talented young singers in New Zealand,” she said. 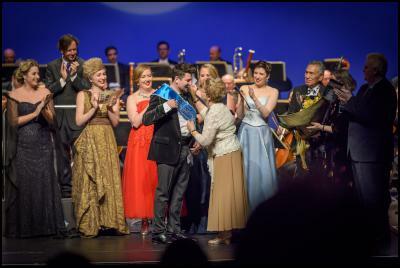 Second place was awarded to tenor Filipe Manu with third place going to soprano Eliza Boom. The New Zealand Aria is one of Australasia’s most prestigious vocal competitions and has been held annually in Rotorua for the past 70 years, helping launch the careers of some of New Zealand’s finest young opera singers, including Pene Pati, Amelia Berry, James Ioelu and Isabella Moore. The Dame Malvina Major Foundation has been sponsoring the first prize in the competition since 2008. Dame Malvina, who presented the first prize to Frederick, said it was a privilege for the Dame Malvina Major Foundation to be associated with the New Zealand Aria and to be able to invest in the future of opera in this way. Find more from Dame Malvina Major Foundation on InfoPages.